Who’s running for 2018-19 SGA president? 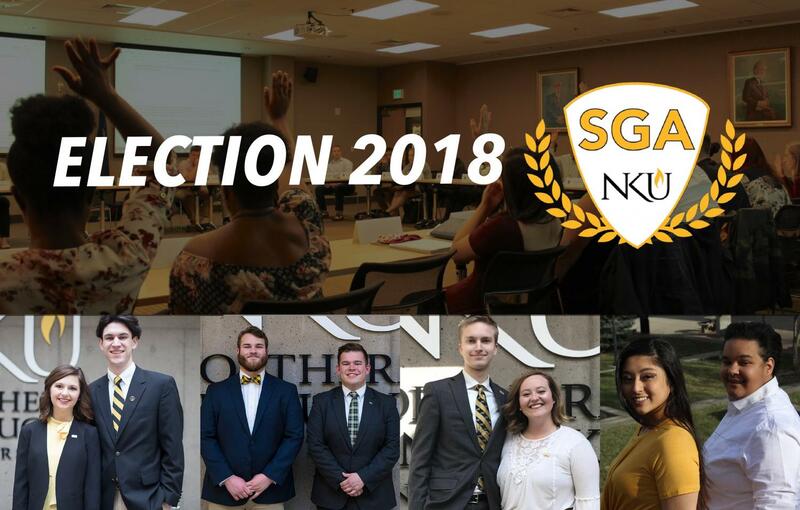 Student Government Association’s spring election season comes to a close this week; voting for president, vice president, senators and executive positions is March 28-29, and results will be announced outside of SGA’s office in the Student Union Friday at noon. About her: junior economics and communications studies major. She’s the current SGA public relations secretary and former senator, has held leadership positions in Kappa Delta sorority and worked as a presidential ambassador, orientation leader and resident assistant. Hannah Edelen and Matt Frey. Her running mate: Matt Frey, junior economics major. He’s president of NKU’s Vertical Frontier Climbing club, is involved in Alpha Tau Omega fraternity, Norse Economics Club, and other leadership orgs. Edelen and Frey said their campaign is student-centric, including planning a dead week before finals and making printing more accessible; in the form of ‘Norse Rates’, they plan to establish more student discounts at local restaurants and businesses (including childcare services in the wake of Early Childhood Center’s planned closure). During The Northerner’s SGA debate on March 22, Edelen said she believes all students should have the same opportunity to learn. Scholarships, she said, are one equalizer, and she would explore using profits from the campus bookstore to fund more international student scholarships. “Scholarships are more than just numbers; they’re relief,” Edelen said. About him: senior accounting major and sports business major. 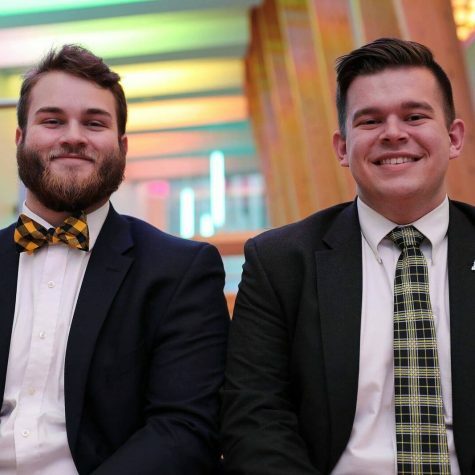 He is the current SGA chief of staff, former secretary of administration and has held leadership positions in Alpha Tau Omega fraternity and the Association of Campus Residents. This is his second time throwing his hat in the ring: Gagné and presidential candidate Kaitlyn Schaefer took 35 percent of the vote last spring. Caleb Tiller and Taylor Gagné. His running mate: Caleb Tiller, junior sociology major. He’s president of Norse Leadership Society, a member of the Freshman Service Leadership Committee and has held leadership positions in Theta Chi fraternity. Gagné and Tiller said a more transparent student government is the “cornerstone” of their campaign. 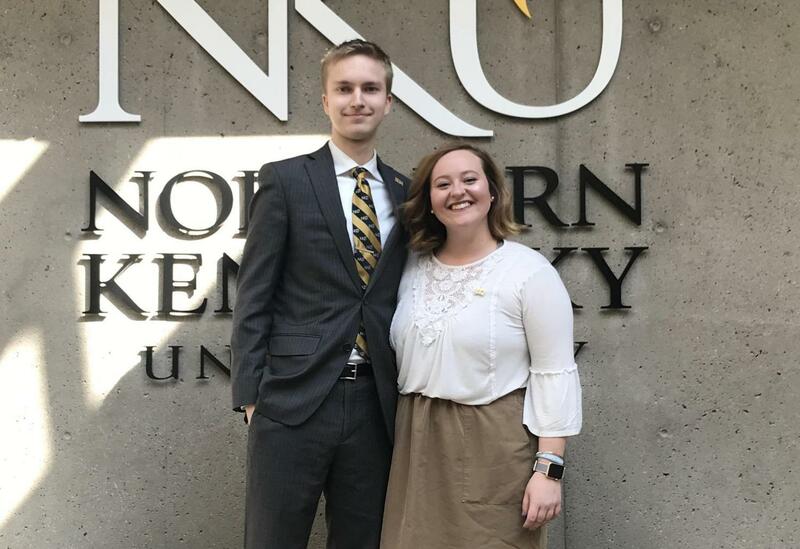 They believe in more communication between NKU colleges, awareness of FERPA protections for DACA students and want to create a mental health support and advocacy program called Students 4 Students. Gagné and Tiller also want to explore bringing Chick-Fil-A, Panda Express, Larosa’s and other chains to the Student Union. Another initiative he’s pushing for is Tapingo, a food delivery service that would bring SU dining to buildings across campus. At The Northerner’s SGA debate, the pair said they want to change sexual misconduct policy to include affirmative consent, moving from a “no means no” to “yes means yes” criterion. Tiller, a mentor in the Norse Violence Prevention Center, said education on that policy would be key. “We cannot only educate our generation, but also the generations before us,” Tiller said. About her: junior organizational leadership major. She is president of Theta Phi Alpha fraternity and works in the Office of New Student Orientation & Parent Programs. She was also a presidential ambassador and head orientation leader. Derek Holden and Samantha Marcum. Her running mate: Derek Holden, junior criminal justice major. He’s president of Tau Kappa Epsilon fraternity, marketing chair of Student Alumni Council and works in the Office of Student Engagement. He was also the man behind the mask for Victor E. Viking. Marcum and Holden said they are running a “no frills” campaign to be a voice for students. 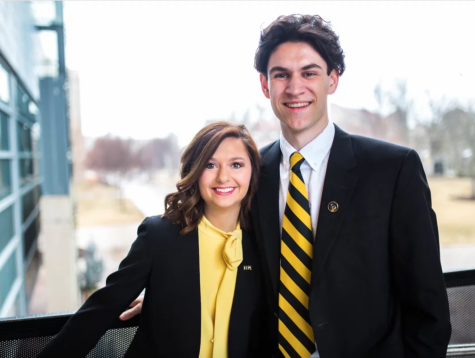 Neither of them have been involved in SGA before running for president and VP. “We are normal, everyday students, and want to bring that into SGA,” Marcum said. Marcum and Holden said they will work on revising tailgate policies to include a student rep on the committee. They also want to extend meal swipe times to accommodate students with early and late class times and expand pedestrian walkways. During The Northerner’s SGA debate, Holden said his priority is getting information to the students on how to advocate against rising budget challenges. About her: junior communications and philosophy major. She is the current chair of SGA’s student rights committee, public relations for Nu Upsilon Black Women’s Honorary, a mentor for NKU’s Latino Mentor Program (LAMP) and a member of the League of United Latin American Citizens’ NKU chapter (LULAC). Jachelle Sologuren and Alex Voland. Her running mate: Alex Voland, junior public relations major. She served in the Army for four years, is an SGA senator, a member of Phi Mu Rho Nu sorority, an orientation ambassador and works as PR chair for Norse V.E.T.S. Sologuren and Voland also believe in more transparency and awareness initiatives for students. 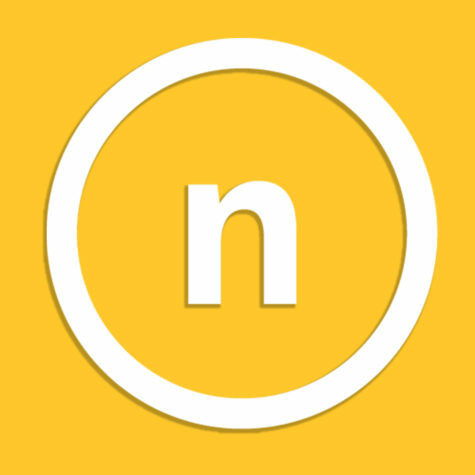 Their campaign supports student rights, promoting diversity and a “GreenER” initiative to make campus less dependent on paper. Sologuren said she is an advocate for NKU DACA students, and her SGA resolution for DACA solidarity passed last October. Sologuren and Voland also advocate for saving the Early Childhood Center, which interim president Gerard St. Amand announced would close in June. Voland, who uses the ECC for her son, said an “Early Childhood Club” could support the children of parents attending college in the ECC’s absence. Elections for student body president, vice president and other positions are March 28 and 29. Students can vote online on OrgSync. Results will be announced outside the SGA offices in the Student Union Friday at noon.